If you’re trendy enough to have an iPhone (or an iPod Touch) and consider yourself a movie junkie, you may be interested in the new app, TrailerSpy Mobile. 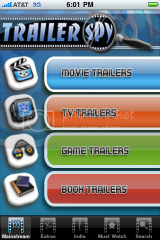 TrailerSpy Mobile is an app that will allow you to watch all of the videos you can find on the TrailerSpy Web site. The site is continuously updated, so no matter where you are, you can see the most currently available movie, TV, video game, and book trailers. Also on offer are fun “extras” like clips, interviews, featurettes, behind the scenes looks, and deleted scenes. You can also easily search for older trailers from within the app if you want to check out something that came out a while ago. The app can be found here in the iTunes App Store. Now, no matter how far you are from a computer, you can impress your friends by having access to the latest trailer releases. Or just privately revel in your newfound geek cred. Follow Rachel Coyne on Twitter at http://twitter.com/TheOpinionatedB. That is pretty cool. If I ever get an iPod Touch, this is the first app that I’ll get. I actually got this for my phone.